Eight days ’til Bottoms Up! I can’t believe it. I also can’t believe that there are pre-order links on both Amazon and Barnes and Noble. That’s like Santa coming early. Yay! To celebrate my first ever release and in honor of my own personal kink- heroes who cook- here is another aphrodisiac recipe. Almond Molé (MOH-lay) Sauce is a rich concoction of ingredients that you wouldn’t normally think would go together – and you really wouldn’t think that once you stewed them for a while and then pureed them they would become something so stupendous. Mysterious. Evocative. Exciting. Versatile, even. Think chicken satay with a seriously hopped-up peanut sauce. Molé is Mexican in origin (and my thanks to the great Bobby Flay for inspiring this recipe). It’s trademark ingredients are chilis, seeds and chocolate – often with garlic and onions – but after that the sauce is open to interpretation. You’re not going to believe it until you try it, especially after you check out the ingredient list, but have faith! Start chucking ingredients into the sauce pot and wait for the magic to happen – both while you are eating it and then later, too. Hello, aphrodisiacs! Try it with roasted chicken or grilled pork loin. It needs something that can stand up to its strong yet subtle flavors. 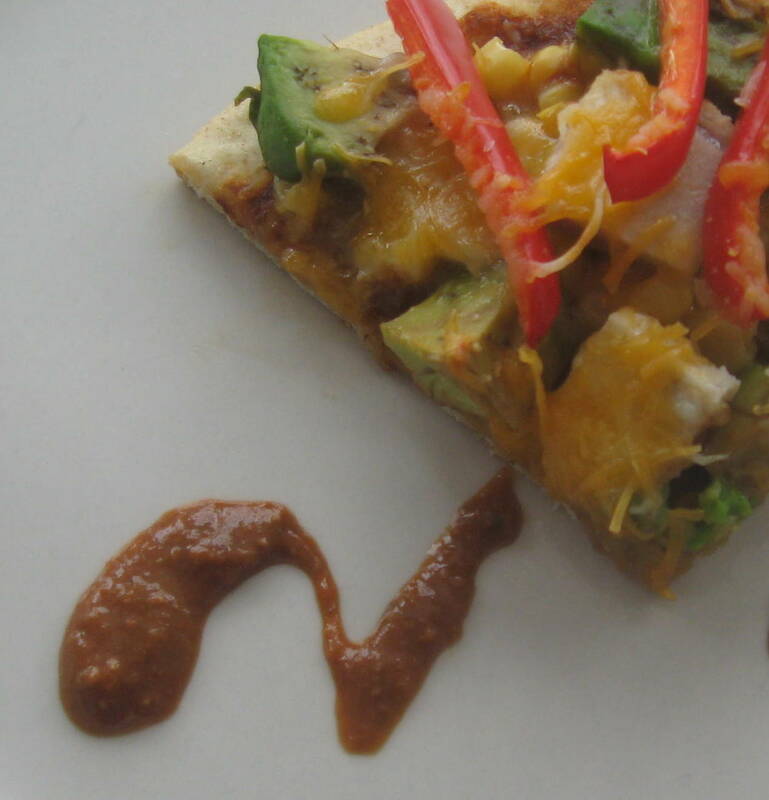 I put it on a pizza topped with some unusual ingredients: roasted pork, avocado, red pepper, corn and cheese. Worked for me, and I hope it will work for you, too. Heat the oil in a saucepan and fry chilis for about 10 seconds on each side. Remove chilis and saute onion until soft. Add the roasted garlic. Stir. Add the chilis and the remaining ingredients and cook, mostly covered, for about 40 minutes. Transfer the sauce to a food processor and puree until smooth. Be careful – it’s hot! Taste for seasoning and serve with imagination. If you’d like to share the results, click on the little balloon-y thing at the top near the title of this post. That’s where you’ll find the comments. Bon appétit! I was looking at that last night! I’ll definitely be getting my copy! I love Mole, have had it down in Mexico and a number of times back in New Mexico. It is just so luscious and decadent, yet with a zing that sets it apart. Never heard of this almond version, just the standard one, and never heard of it on pizza either but sounds delicious. Hope to be able to try this out sometime! Since I had to make it to take a picture of it, we’ll be finishing ours up with a roasted chicken tonight! A chef I used to work with in Nashville, TN made it for me for the first time. He used pumpkin seeds. I’m jealous that you’ve had “real” mole!